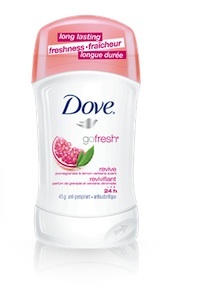 Visit Dove’s facebook page and be one of the 26,000 people who get a free sample of Dove GoFresh Anti-perspirant products. Plus you get a coupon for $2 off your next purchase. You can visit the Dove Facebook page here. When you click on the link to get your sample and coupon, you will be prompted to enter your contact and mailing address information. They will send out your sample to that address. Give your underarm skin extra care plus 24-hr odour and wetness protection with ¼ translucent moisturizers in Dove® Ultimate go fresh® revive™. In the lively scent of pomegranate and lemon verbena, it’s formulated to stay on skin, not on clothes.